29 1/2" Wide x 15 1/4" deep x 50" High. 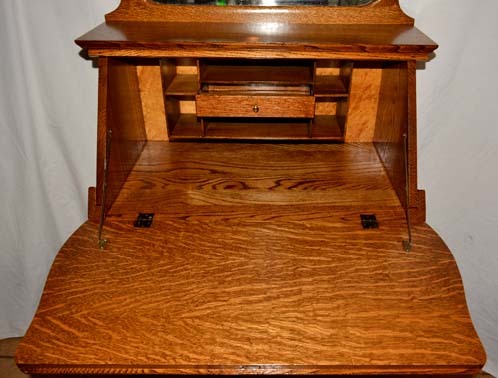 This Ladies Oak Larkin Desk is both functional and decorative. It is a perfect place to do your paperwork and can be at home in your kitchen, parlor, great room or bedroom. The desk is a combination or riff sawn and quarter sawn oak. It has original brass drawer pulls, and a key that fits the lid and the drawer. The oval beveled glass mirror is clear and also original to the piece. 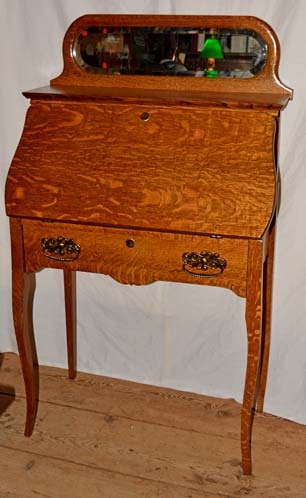 This is a charming desk that was made by the Larkin Company of Buffalo, New York, at the turn-of-the twentieth-century.